Regular visitors to Rebel Voice will be familiar with how the Unionist population, or a large portion of it, behaves with a complete lack of respect towards their Catholic and Nationalist neighbours. One symptom of these supremacist attitudes is the existence of what is known as the loyal orders. One in particular dominates. 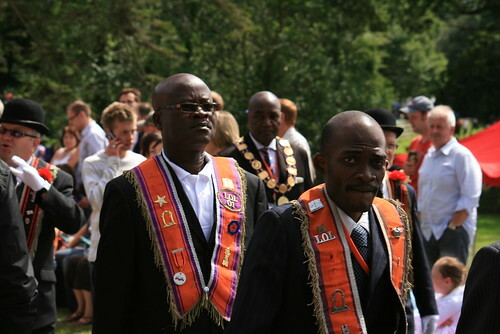 The Orange Order was founded in County Armagh in the north of Ireland in 1795. It is a strictly protestant, Unionist and anti-Catholic organisation. It is acknowledged as sectarian and has been involved in fomenting division and conflict across Ireland for more than 200 years. At one time, after Ireland was partitioned in 1921, the Orange Order effectively ruled the northern statelet, with institutionalized discrimination and religious bigotry the norm. In 1998, the Belfast (Good Friday) Agreement was signed bringing an end to decades of conflict between the PIRA and INLA on one side, and the various forces of colonial occupation on the other, including the British Army, MI5, MI6, RUC and Unionist paramilitaries. The Agreement contained the – now much used – phrase, ‘parity of esteem’. This was a means of stating that there needed to be mutual respect between both Nationalist/Republican and Unionist communities for there to be a real peace. There’s nothing like stating the obvious. Since that time, when fickle and specious commentators trumpeted the glories of the agreement, there have been marginal improvements in Six County society. Sadly, the much vaunted parity of esteem did not materialize in the way intended. One of the main stumbling blocks towards achieving this aim of mutual respect is that of the loyal orders. 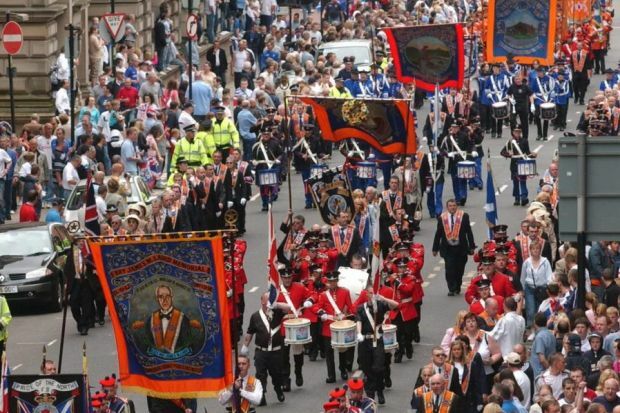 This encompasses the Orange Order and its kin in the Royal Black (nothing to do with race), the Royal Arch Purple (damn but Unionists love their colours, a few more and they could make their own gay flag) and the Apprentice Boys of Derry (note, no London prefix there, ever). These organisations are touted by deluded Unionists as cultural, yet their collective history tells a tale that would shock any neutral observers. The Orders are steeped in vile sectarianism, triumphalism and the murder of innocents. Today, there are thousands, yes that’s right, thousands of loyal order marches across the Occupied Six Counties (OSC) serving a declining and aging population of less than one million Unionists. These anti-Catholic gangs parade on a regular basis through areas and towns that have Catholic residents and even Catholic majorities. The entire spectacle is akin to allowing the Ku Klux Klan to march through black areas of the United States. Brooklyn has a population of 2.65 million residents and is racially heavily mixed. The OSC has a population of 1.8 million. Try to imagine 100 Klan rallies being held in that borough of New York. Now try to imagine thousands of such marches and parades taking place there each year. You get the picture? Catholics in the OSC have been tortured for centuries by these so-called loyal orders. They have been kicked and beaten. They have had Union and paramilitary flags forced on them. 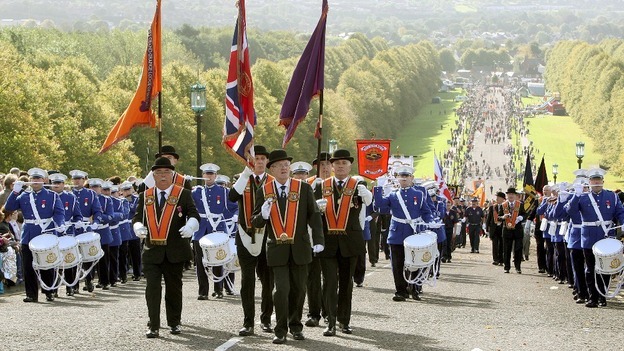 They have been obliged to flee their areas every July as the Orange Order madness reaches its peak. They have been murdered. They still have to endure this treatment. It is state sanctioned. 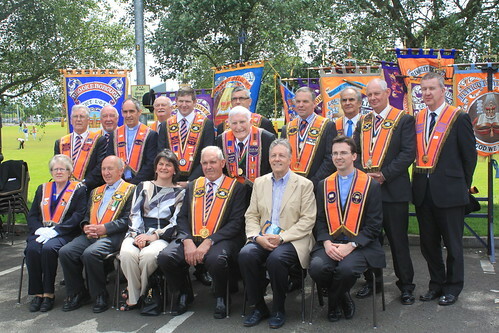 Some misguided and attention-seeking members of the Nationalist community have moved to assist the Orange Order in gaining greater credibility within the Catholic population. Remember, this is an anti-Catholic organisation. Mary Lou McDonald of Sinn Féin, Leo Varadkar who is Taoiseach (leader) of the southern Irish state, Mary McAleese who was former President of Ireland and Jarlath Burns, footballer and Catholic school principle, are noted for their pandering to Orange whims. Of those 4 mentioned, only McAleese had any real experience of Orange brutality as her family was forced out of Ardoyne in north Belfast when she was a young girl. She is known for socializing with Unionist paramilitaries in the company of her husband. None of the 4 have a great deal of credibility when it comes to promoting an anti-Catholic organisation within a Catholic community. To repeat an analogy, try to imagine black members of US society promoting the Ku Klux Klan within the black community. Picture a black leader attending a museum dedicated to the Klan. Listen as he expounds upon its greatness. Hear him encourage black people to embrace the Klan. That is what has happened with the aforementioned members of the Nationalist community in Ireland. The word quixotic springs to mind. So does the word imbecile. Although the Orange Order is no longer as formidable as it once was, it still carries a great deal of weight in society in the north of Ireland. It also has lodges in Scotland, England, Wales, Canada, Australia and Africa. All are sectarian. Many Unionists, particularly the younger generations are increasingly moving away from the inherent bigotry to be found in the loyal orders. But the pace of change is slow. The supremacist marches continue unabated where they are not welcome. Majority Nationalist towns and villages, such as Magherafelt, Rasharkin, Enniskillen, Castlederg, Cookstown, Ballycastle, Newry and Armagh (to name but a few) regularly have to contend with bigots marching through. Others, with sizable Catholic minorities such as Ballynahinch, are plagued with flags and sectarian marches. To consider one example of where the worst excesses of Unionism has raised its ugly head, we will take a look at the village of Dundrum in County Down on the East coast. In the census of 2011, 60.51% of the population stated that they came from a Catholic background. Yet during the month of July, Union flags dominate the skyline in the village. In general, Catholics are not Unionist (although that is not a hard and fast rule). It can be seen that the Orangemen care little for the rights of the Catholic majority of Dundrum as they erect their symbols of supremacy throughout the village. These scenes are repeated ad nauseum throughout the OSC. Should anyone attempt to remove the offending flags, they are arrested by state forces in the guise of the PSNI. The reason given is usually for being guilty of causing a breach of the peace. So Unionists can erect Unionist flags and banners and even arches in Nationalist areas, yet Nationalists cannot do anything about it. Should Nationalists try to return the favour by putting up their own flags in Unionists areas, then riots would ensue and the PSNI would endeavour to arrest as many Nationalists as possible. Parity of esteem is a fine phrase. But in society in the Occupied Six Counties it is rendered meaningless where Unionist flags and symbols are involved. As the twelve of July approaches, tension mounts and Catholics head south. They leave the sectarianism behind, knowing that it will be there for them when they come home again. And it will still be there for them, waiting for generations more, unless a serious effort is made to tackle the nasty problem that is the loyal orders, most ably represented by the goons of Orangeism who stomp over Catholic rights on behalf of the Orange Order.